Although I'm not the greatest fan of melodic and symphonic metal, Edenbridge from Austria, who started in 2000 and released their fifth studio album only six years later, are one of the few exceptions. Edenbridge call their style angelic bombast metal and the vocals by Sabine Edelsbacher are among the best in the female metal world. Especially on the new record, her voice has become more expressive than ever before and comparisons to Lana Lane may be allowed. But that's not the only improvement on the new record. 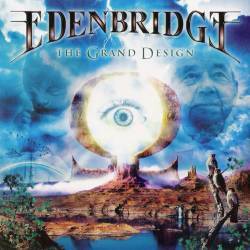 The progressive elements that have been present on all previous Edenbridge records are much more dominant on The Grand Design. The opener Terra Nova is probably the best track they have written so far, drawing parallels to Saga's Generation 13 classic. Backing vocals and choirs give several songs a rock opera or musical touch. Another novelty is the presence of a single on the record. Evermore is not even four minutes long and still is a great symphonic metal tune. The highlight on The Grand Design is the ten minute title track which is an epic masterpiece with choirs, Greek mandolins and Chinese folk passages. Unfortunately this great improvement is only present on six tracks. There are two short ballds which are so mellow that they would fit a Walt Disney adaptation of Cinderella. The limited edition bonus track Empire Of The Sun would be better placed on a guitar hero album. If you have a singer like Sabine Edelsbacher, you don't need instrumental songs, even if band leader Lanvall is an excellent guitar player. Not every song on the record is a crusher, but Edenbridge have nevertheless surprise me on several occasions in a positive way. I wish they would in the future follow the epic path which suits them best.